Me: Maa! It’s Janmashtami on September 3. What’s special on the menu for the day? Maa: Your grandmother made delicacies when we were kids but we never observe Janmashtami with much fervour so I’ve never bothered. Maa: Go ask Verma aunty; they celebrate Janmashtami every year, I’m sure she’ll cook up something special. Verma aunty – our front-door neighbour, Maa’s BFF and a brilliant cook – rattled off a list of dishes that had my eyes popping out in surprise! “All of that sounds pretty intense. Can you teach me something simple? I don’t want to labour over the kitchen fire,” I requested, sending her into peals of laughter. “Mewe ka paag is your answer then,” said Verma aunty. Ingredients please, I prompted, starting the list myself with mawa (khoya). “Rapti, mewa and mawa are two different things,” aunty immediately said. 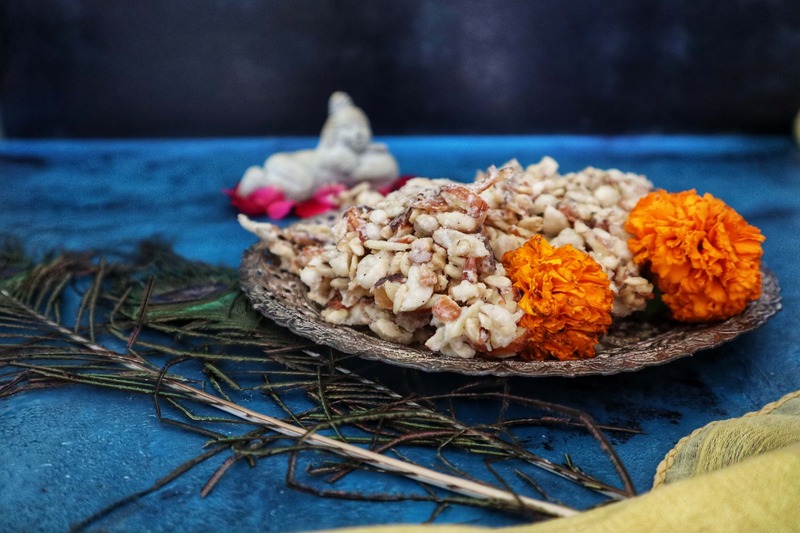 “Mewa here means dried fruits & nuts while the mawa (khoya) you’ve written is milk solid used to make Indian sweets,” she said, explaining that mewe ka paag could loosely be translated into ‘dried fruits & nuts barks’. Mewe ka paag, said aunty, is among the dishes that has always been made at her home for Janmashtami. Easy to make, healthy and with a long shelf life, mewe ka paag is significantly made as an offering to Devaki, Krishna’s mother. “The dried fruits and nuts are rich in natural oils and nutrients making them the perfect food supplement for new mothers,” said aunty, explaining the significance. For those who have been caught unaware, Lord Krishna Janmashtami also known as Janmashtami or Gokulashtami is a Hindu festival celebrating the birth of Lord Krishna. Marked with much fervour over a period of two days, celebrations include devotional singing and dancing well into midnight – the hour Krishna is believed to have been born – and some rituals the next day. On that note, here’s the recipe for mewe ka paag. I’ve made the paag using a selection of dried fruits/nuts/seeds of my preference. Feel free to try different combinations. Don’t skimp on the use of ghee or sugar syrup. You can try replacing sugar with jaggery and use the same method to make health bars to tide you through snack cravings. Do leave me a note if you make the mewe ka paag and tag From The Corner Table on Facebook or Instagram. But if payesh (milk-based pudding) is your thing, then check out the recipes for chhana payesh and khejur gur payesh in Payesh & Goodwill to Usher in the New Year. And if it’s something a tad bit different that you are looking for, then the water chestnut pudding written about in Devotion, Prayers and Water Chestnut Halva should be perfect for the taste buds. Dried fruits/nuts/seeds roasted and brought together with sugar for a sweet crunchy snack. Place a non-stick pan/kadhai on low flame and heat. Roast the muskmelon seeds in the heated vessel, stirring frequently. Once all the seeds are swollen and you get a nutty aroma, remove and set aside to cool. In the same vessel, roast almond slivers till slightly brown. Remove and cool. Add 2 tablespoons ghee to the pan. Once the ghee melts, add the chopped lotus seeds. Roast, stirring constantly, till they get a golden hue, ensuring each piece is covered in ghee. Remove to cool. Add another tablespoon of ghee, melt and add the dried coconut slivers. Roast till the coconut slivers have browned. Drain and set aside. Grease a 10 inch baking tray or plate with melted ghee. In a non-stick pan, pour ¾ cup water, add the sugar and melt on low heat. Stir frequently, allowing the sugar to melt completely. Let the sugar syrup boil until it reaches a consistency bit thicker than water. Remove from heat and add all the ingredients – almonds, muskmelon seeds, puffed lotus seeds, raisins and coconut slivers – in the sugar syrup, mixing vigorously. Place this syrup and all-things-dried mix on low heat, stirring and mixing till the sugar syrup has dried up. Spread this mixture on the greased plate. Even it with the back of a ladle and allow to set. Now comes the tricky part. If you are the prim and proper kind, you might want to cut the mixture into diamonds or squares when it is partially cool. If you are anything but proper – like me – wait till the mixture has cooled completely and break off chunks. Your dried fruit-&-nut bar is ready to eat. These can be stored in an airtight container for up to a month.